Good Garage Scheme Car Servicing in Great Britain : Motorists would rather money spent on potholes rather than royalty, foreign aid and defence budget, Good Garage Scheme learns. Motorists would rather money spent on potholes rather than royalty, foreign aid and defence budget, Good Garage Scheme learns. Research conducted by Autoglass has discovered that over half of those surveyed in their poll would favour money allocated to funding the Royal Family being spent on pothole repairs instead. British roads have suffered badly with the harsh conditions over the previous two winters. Motorists would prefer to see expenditure on road repairs increased with spending on foreign aid and the defence budget slashed as a consequence. Eighty per cent of respondents deemed fixing potholes as the highest priority for road improvements expenditure with spending on road widening, speed camera provision and traffic calming considered much lower priorities. Potholes are a real problem on Britain’s roads. Motorists do their utmost to avoid them but can still incur damage to their vehicles. A website has been set up by Warranty Direct concerned solely with potholes. The website provides guides and advice concerning making a claim, enables a motorist to report a pothole, provides some facts and figures concerning the issue and gives motorists the opportunity to share stories about their experiences. 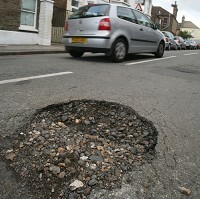 For more information, visit www.potholes.co.uk. Also on the website, viewers can read articles from various sources such as the BBC or various national or local newspapers.